I have always dug the Rurales and their association with the Arizona Rangers, fighting crime along the border in the early 1900s. I was looking through my Mexico files and re-discovered a little booklet by the artist Bill Leftwich who apparently self-published "Los Rurales de Porfirio Diaz" in 2007. The author-illustrator wrote his forward from Fort Davis, Texas in 2004. "The Guarda Civil horse troopers of Spain served as a model for the Rurales. Hard, disciplined men with unlimited power, keeping a close watch on the people with only the President's interests in mind." That would be Porfirio Diaz who ruled Mexico for 30 years and his dictatorial regime led almost directly to the Mexican Revolution. So, the Rurales have a bit of a fascist bent as Porfirio referred to his main man in Sonora as his "mailed fist." This presumes to "mailed" as in a suit of armor, but unfortunately, to English speakers, it comes off as he Fed-exed his main man to the sites of contention. According to Leftwich, "the first rural constabulary was in the 16th Century and was called 'Santa Hermandad,' or, Holy Brotherhood. This outfit was formed by landowners to eliminate the lawless elements in their areas. Another forerunner of the Rurales was an organization of 1710 called, the 'Acordada.' The purpose of the Acordada was to 'apprehend and jail highwaymen." Bill translates "Acordada" as "decision, order, and to resolved by common consent." Leftwich died in 2009 at age 85. He worked in Mexico in the 1960s and met guys who knew the Rurales and the pamphlet has little nuggets in it, like, during the Presidency of Benito Juarez they were called "Cuerpo de Caballeria de Defensa Rurales" or, Body of Horsemen For Rural Defense. They were famous for wearing leather pants and jackets and were often referred to as "Los Cuerudos," the leather guys. Ha. Love that stuff. 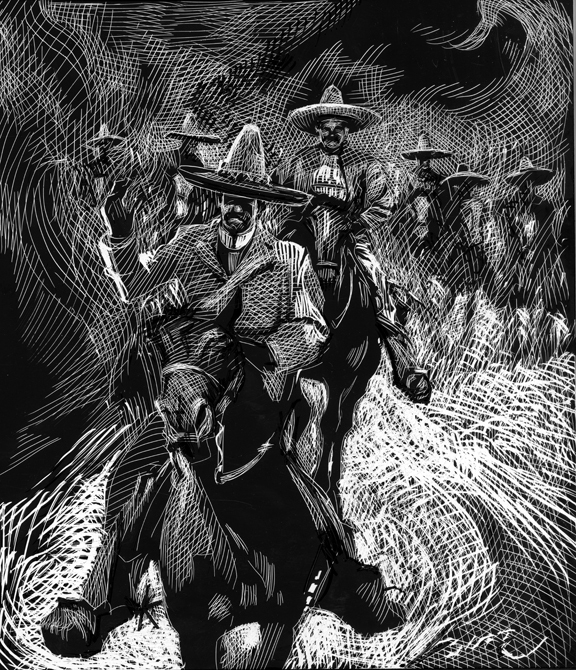 Tomorrow, I'll get into their uniforms, which were designed by Porfirio Diaz himself and based on the charro rig. Ay-yi-yi! You are going to dig this. "God is good, but He is better in Spain than in Mexico."